Bored with your default font displayed in your Windows Mobile Device? Or want to personalize your own mobile device with stylish font or bigger font size for easy viewing? Here comes a very tiny but yet useful software utility – ING Change Font that can help to change your default font on your Windows Mobile devices. Users can download the .cab file and transfer it through active sync to the mobile device. Just launch the application and it will bring users to a simple GUI for quick setup. 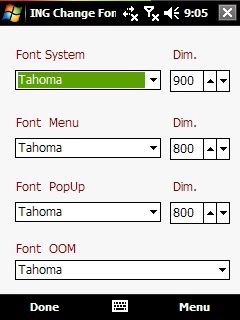 Basically there are four font settings that can be configured independently, namely Font System, Font Menu, Font PopUp and Font OOM. And for each font setting, user can choose from a drop down list of nine different fonts such as Courier New, MS Sans Serif, Tahoma, Abscissa and etc. In case you think the font size is too tiny, there is an option to adjust its dimension up to 1600 (by default it is 800). However, users may need to verify the actual effect after soft reset so that it won’t appear to be too huge in your tiny mobile screen. The software utility is downloadable at MobileHTC free of charge and is compatible with Windows Mobile version 5, 6 and 6.1.